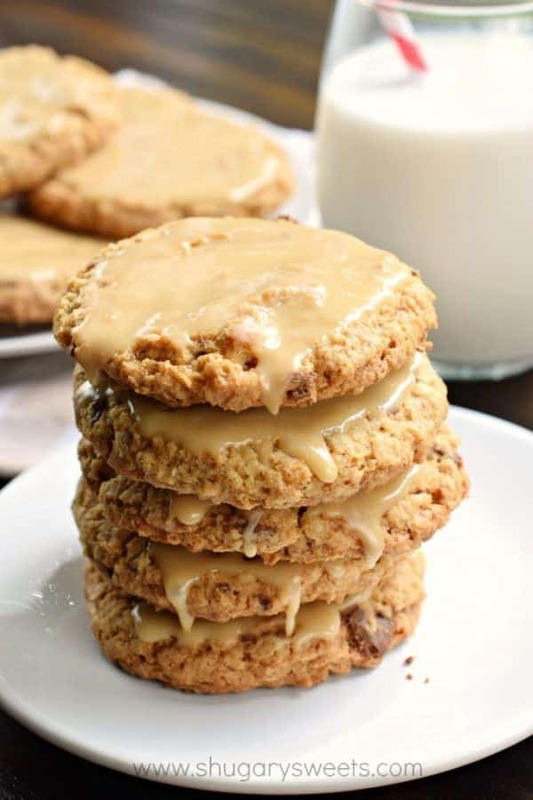 These homestyle Iced Caramel Toffee Oatmeal Cookies are better than anything bought in a store! Bake a batch today and watch them disappear! Baking cookies is one of my favorite things to do on a Monday afternoon. And while I don’t get the chance to do this every week, I really do try! 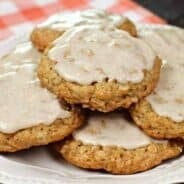 A couple weeks ago I took my favorite Iced Oatmeal Cookies recipe and gave it a fun makeover. It’s already the most perfect cookie recipe, so I wasn’t sure if I should even attempt to mess with a good thing. I’m so glad I did. I added toffee bits to the cookie dough and then topped the cookie with a caramel icing. HEAVENLY. My husband and I couldn’t stop grabbing these all week. Not only are the perfect with your morning cup of coffee…but they make a great dessert after dinner too. Not to mention they went into quite a few lunch boxes that week with my kids! Using a food processor or blender, pulse your oatmeal until it’s partly ground (I do this about 6-8 times, for one second each pulse). This isn’t a mandatory step, but I think it gives the cookies a better texture! I use a 2 Tbsp cookie scoop to portion out my cookies. Keeping them the same size helps them bake more evenly! Use parchment paper. With these cookies I find it makes a big difference so that the toffee chips don’t stick! Bake for 14-16 minutes. I tend to go for the 16 minutes (as I like a little crunchy exterior to these cookies). 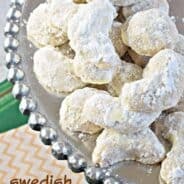 Just remember, after putting the icing on these cookies, they will soften once you store them…. In a food processor, add oatmeal and pulse until partly ground. I pulsed mine 6 times for about 1 second each time. Set aside. In a large mixing bowl, beat together the butter with sugars. Add eggs and beat until fully blended. Mix in the oatmeal, cinnamon, salt, baking soda, baking powder, and flour. Mix just until combined. Fold in toffee bits. 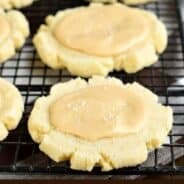 Drop by 2 Tbsp scoop onto a parchment paper lined cookie sheet, about 3 inches apart. Bake for 14--16 minutes and cool completely on wire rack. For the icing, whisk together the sugar and caramel sauce. Add more or less caramel for desired consistency (each brand has it's own consistency, so you may need to use more or less). Frost each cookie and allow to set (about 30 minutes). Store in airtight container for up to 5 days for best flavor. ENJOY. 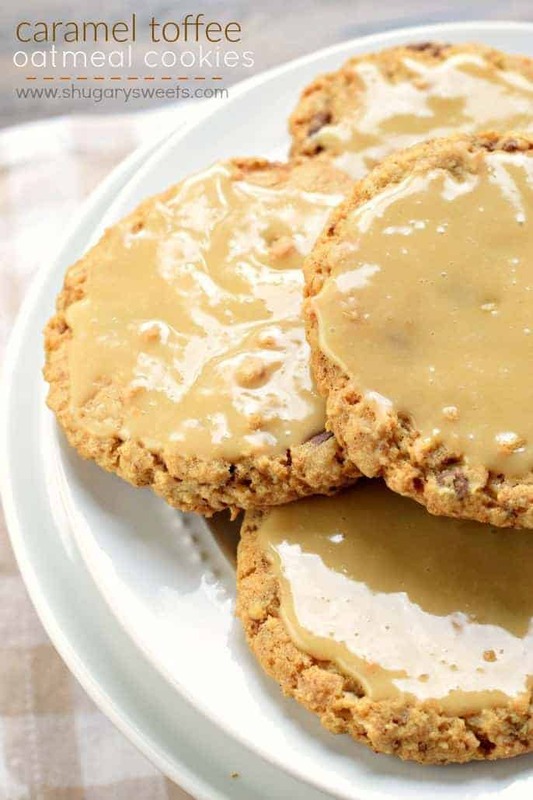 Toffee and oatmeal is the best combo. These are definitely crack cookies. Can’t wait to try that icing! These look so yummy! I definitely need to try them! 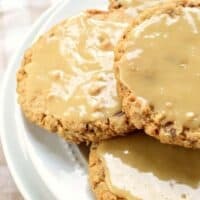 Oh my word, I love toffee and oatmeal cookies. Pinned these! Can’t wait to try! It’s been so long since I’ve had a cookie like this! Love the addition of toffee bits! I could eat that caramel icing with a spoon! Love all of your tips you included for making these beautiful cookies too! Heavenly, for sure! Love the toffee bits, and that frosting! YUM! These look incredible! Sharing on my FB page! I’ll take a dozen of these please! oooh this is BRILLIANT. 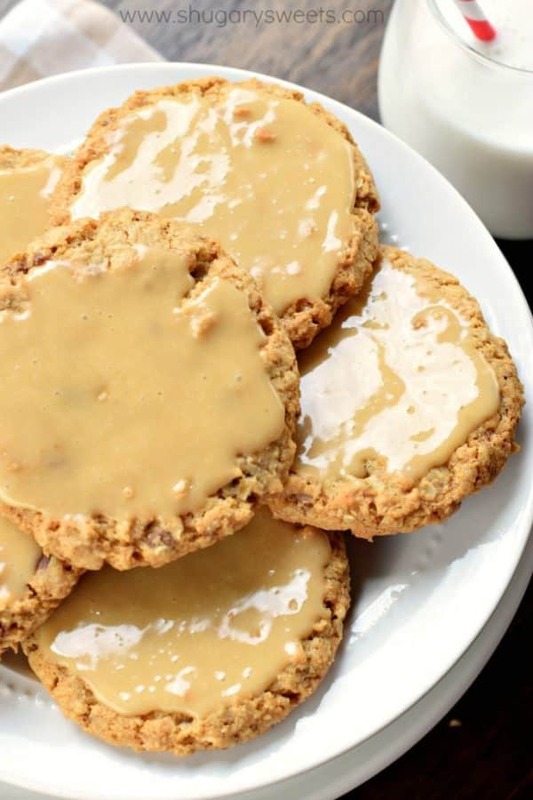 Toffee and caramel are a natural match and I totally have to try this!